"James Johnston Signing Contract "
A black and white photograph of several men gathered around a desk for a contract signing. Autographed, "To my Friend Charlie [sic] Miller, James J. Johnston, 6/19/36." 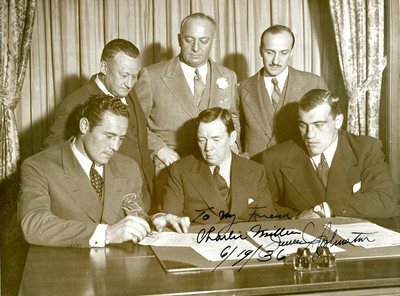 Boxer Primo Carnera is also in the group, furthest to the right.